The gist: Low self-esteem can grip all of us. And feeling self-doubt is part of being human. Understanding your psychology can help you overcome it. In 1911, a young man by the name of Harry was struggling with low self-esteem. He’d met a woman, Bessie, and they became friends. Before he knew it, he’d fallen in love. There was a problem, though. Harry didn’t know if Bessie felt the same way, and his self-doubt was tearing him apart. Speaking of diamonds, would you wear a solitaire on your left hand should I get it? Now that is a rather personal or pointed question provided you take it for all it means. You know, were I an Italian or a poet I would commence and use all the luscious language of two continents. I am not either but only a kind of good-for-nothing American farmer. I always had a sneaking notion that some day maybe I’d amount to something. I doubt it now though like everything. But I never had the nerve to think you’d even look at me. I don’t think so now but I can’t keep from telling you what I think of you. Say, Bessie, you’ll at least let me keep on being good friends won’t you? I know I am not good enough to be anything more but you don’t know how I’d like to be. Harry, it seems, was no master of seduction. In time, though, he must have built an effective tool for dealing with his crushing self-doubt because he did eventually marry Bessie, and today he’s more widely known as President Truman, the man ultimately responsible for ending World War II. How did he overcome his crippling self-doubt? A key quote from his time in office and notes from cognitive psychologists give us a hint. To understand how and why uncertainty holds you back in life, it’s best to understand the foundation of doubt first. In the world of science, psychologists like to classify doubt in two separate categories: general doubt and self-doubt. General doubt: uncertainty over externalities—things outside of you. You might have doubt about a politician’s promise or that the pizza will show up on time. There’s an uncertainty about what’s happening around you. Self-doubt: uncertainty within yourself. This is when you question your own abilities and struggle with your decisions, like what toppings you should choose for that pizza. In many ways, general doubt can be good because it forces you to re-examine your beliefs and think critically. If you’re really hungry and doubt the pizza place will get your order to you on time, you might find a more reliable shop. But self-doubt almost always gets in the way of what you want. If you’re really hungry but can’t decide which toppings will make you happiest, you’ll struggle with the decision until you and all your friends are hangry2 and no one is happy. So, general doubt = good, but self-doubt = bad. That’s nice to know, but where does self-doubt come from? And how do you attack it when it’s crippled you your whole life? We look for evidence that our abilities aren’t good enough. Rather than look for evidence that you have what you need to succeed at something, you look for the opposite—what’s missing. You quickly find it and spend more time doubting your plans. We hold ourselves to impossible standards. By becoming a perfectionist in everything you do, it makes it easy to point to your own failings when what you attempt doesn’t measure up to your standards. We overanalyze simple decisions. Rather than making small decisions and moving on, you wring your hands endlessly, confused by information overload. We make friends with people who reinforce our self-doubt. It’s natural to take on the characteristics of people we spend time with, and we spend time with people who make the beliefs we have about ourselves even stronger (see #1 above). All these things lead to an interesting psychological effect called confirmation bias—we look for and give value to the evidence that reinforces our belief that we aren’t good enough and ignore evidence that would prove the opposite. Slowly but surely, you create a negative feedback loop that gets stronger and stronger. Basically, your self-doubt becomes a self-fulfilling prophesy. One of Truman’s tactics for overcoming his self-doubt was not letting the torment of many decisions pile on top of each other. If an important decision had to be made, he focused on that decision alone and didn’t let decisions from days gone by weigh him down. The first strategy, interestingly enough, is to doubt your doubt. Take the same energy you spend doubting your decisions and direct them at the doubt itself. What’s been learned is that doubt can actually destroy itself—at least for a little while. Rather than ask yourself “What if I’m not good enough?” ask “What if I am?” Instead of “What if I make the wrong decision?” try “What if I don’t make one at all?” Force yourself to think of the consequences of inaction. Next, shake your head—as if to say no—when you’re having self-doubting thoughts. This sounds absurd, but the effect of body language on your decisions is actually well-studied and profound. Just the act of shaking your head while thinking a negative thought is enough for them to cancel each other out. Think of it like subtracting a negative in a math problem. Finally, try giving yourself a time limit to make decisions. Thanks to Parkinson’s Law, we tend to waste as much time as we give ourselves on any given task. But a time limit with a real consequence can be incredibly effective at getting yourself to focus on the important and making decisions that matter. 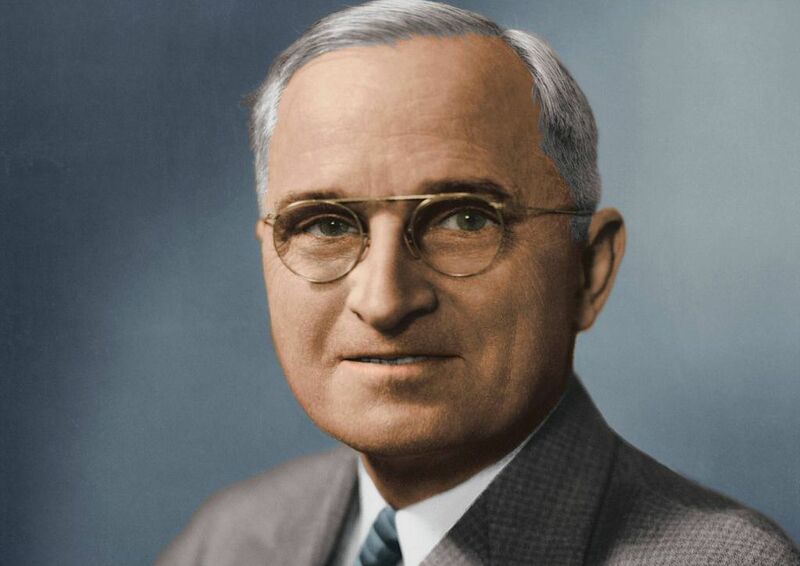 President Truman (and likely every other president / head of state / important person) dealt with self-doubt his entire life, but what set him apart from the typical self-doubter and allowed him to rise to the most powerful role in the world, is that he only struggled with his decisions while he was making them. Once it was made, he moved on to the next. This kept him from drowning in a sea of doubt—each decision piling on the one before it. Compartmentalize your decisions and don’t look back. Shake your head when confronting doubt. Enforce time limits on your decisions. When you struggle with self-doubt, the road ahead looks bleak. We’ve all experienced it. But if there’s hope for a young man who can’t even talk to his future wife without putting himself down to rise to the highest office in all the land, there’s hope for you and me, too. Archived at the Harry S. Truman Presidential Library & Museum. The state in which your hunger morphs into inexplicable anger. If you’ve ever been grumpy and the only thing that relieved it was eating, you’ve experienced hanger. Source for items #1 and #2 is here.